Click on the above link if you want to hear it? WARNING: every minute or so, you hear a woman’s voice over it saying iHeart Radio on demand. What a stupid idea? The people that want to hear this song are the fans? For the people that want to pirate it, they already would have their hands on the album or have a source that would deliver it to them. Ozzy’s take on the meaning of the song, from Loudwire. The below excerpt is from that Loudwire post. To be honest, its nothing original or innovative. So any people out there looking for anything groundbreaking, this is not the song. 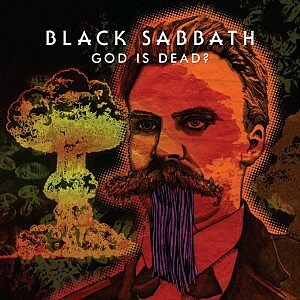 ‘God is Dead?’ is everything Black Sabbath fans want from the metal innovators, and if the rest of ’13′ maintains the quality of Sabbath’s latest single, we could be looking at a contender for best metal album of 2013. Is this guy serious? Graham Gruhamed Hartmann wrote the above in the Loudwire article referenced. It’s very rare that Loudwire commentators review works on a critical basis. To be honest this song is pretty boring. It doesn’t have enough ideas in it to sustain the 9 minutes. It’s not a bad song, nor is it a great song. I think 5 minutes would have been enough. To label it as everything Black Sabbath fans want, is not true either. I am a Black Sabbath fan, and if the rest of the album is like this song, i wont be impressed. This is the difference to 1978. There is so much content being released these days, that if you want your music to be around for a year or more, the music needs to be great. Ozzy’s album sales since Down To Earth have not been stellar and Black Sabbath’s sales (even Heaven and Hell sales) have not been stellar either. And from what i heard just now, the music isn’t great. The slow gloomy riffs worked early on in Sabbath’s career because the music was referencing their gloomy life, growing up in Birmingham. The gloomy riffs don’t have the same effect now. Maybe the gloom is referencing Iommi’s fight with cancer. Regardless, the shock effect is gone. This is Sabbath playing it safe. I know it’s only one song, however I can see the album doing the same spiral that Bon Jovi and Aerosmith had with What About Now and Music From Another Dimension. I have my $180 tickets to see Black Sabbath next Saturday in Sydney at the Allphones Arena. I am expecting a show of all the classics and maybe this new song thrown in. I hope not.